This high-altitude capital city, at 2,355m (7,726 ft), hides a multitude of charms. Though sprawling and chock-a-block with traffic, it is home to many fascinating museums including the Ethiopian National Museum where the star attraction is the 3.2-million-year-old Lucy, humankind's oldest ancestor. When the sun goes down, enjoy a fantastic Ethiopian meal with local music and dance at one of the many cultural restaurants scattered across town. According to folklore, Aksum was once home to the legendary Queen of Sheba mentioned in the Old Testament. The local legend says she travelled to meet King Solomon in Jerusalem and bore him a son, King Menilik I, who was raised in Ethiopia but later travelled to Jerusalem and came back to the Kingdom of Aksum with the Ark of the Covenant. Today, the Aksum Stelae Park is the main attraction but you can also peek across the St Mary of Zion Church to see the chapel where the Ark is supposedly kept. On the first seven days of each month (according to the Ethiopian calendar), there is a procession where St Mary of Zion's replica Ark is paraded through the streets with thousands of pilgrims following the Ark and chanting in unison. The procession, locally known as Mihla or Mehelela, starts at 0500 on Daro Eila (square). An easy daytrip from the walled city of Harar, tracking elephants on foot is the major highlight of a visit to Babile, though the sanctuary is also home to plentiful birdlife, gazelles, and rarely-seen lions, leopards and cheetahs. Gorges give way to rocky outcrops and tree-studded grassland home to more than a quarter of Ethiopia’s elephant population. The Bale Mountains offers hikers and horse riders high-altitude mountain scenery. The circuit, with a well-organised series of lodges along the way, passes through remote villages, high grasslands and dense forest, with great wildlife spotting potential. Surreal and otherworldly, the Danakil Depression is one of the lowest and hottest places on Earth, coming in at 125m (410 ft) below sea-level with temperatures that regularly top 41°C (106°F). This geological wonderland is a magical place featuring vistas of swirling orange twisted rock, lava lakes, and fiercely traditional nomads. The star attraction is Erta Ale, an active volcano bubbling at 1,000°C (1,832°F). Africa's own fairytale castles are a testament to the wealth and whimsy of Emperor Fasil who made Gondar his capital in the 17th century. The 7-hectare (17-acre) UNESCO World Heritage site is now a museum complex encompassing six fortified stone castles and a sunken pool where Gondar's colourful annual Timkat (Ethiopian Epiphany) takes place with a re-enactment of the first baptism. Entrance fee is 200 Birr per person. The historic walled city of Harar is a labyrinth of dusty alleyways. Once the commercial hub between Arabia and Africa, legendary tales led both explorer Richard Burton and French poet Rimbaud here. Today Harar oozes a lost-in-time ambience that enchants all who visit, while the Muslims consider it the fourth holy city of Islam. The hyena feeding ritual, which takes place every evening on its outskirts, adds to its exotic appeal. Despite modernity's slow encroachment, the Konso people have stayed true to their cultural heritage, proudly preserving their unique maze-like village architecture and way of life. Some of the top places to visit in the region are the town of Konso itself and the villages of Buso, Dokatu, Gamole and Macheke. Situated by the Nechisar National Park, this high-altitude lake is home to a healthy population of crocodiles who like to sun themselves on the banks of the lake or glide through the water. Afternoon boat trips on the lake where you can see these massive creatures up close and personal (and maybe hippos too) are a must. The source of the Blue Nile, Lake Tana is one of Ethiopia's most fascinating places. Fishermen glide across the shimmering lake surface in traditional papyrus boats, while many its 37 islands are home to priestly communities and their ancient, round thatched monasteries decorated with dazzling biblical murals. The best way to explore the lake monasteries is on a boat trip - but please note that not all monasteries allow female visitors. Not far away is the impressive Blue Nile Falls, best visited in August and September after the rainy season. This massive complex of churches, hewn out of rose-pink rock, is a feat of 12th-century ingenuity and sheer willpower. Walking into one of the churches amid the eerily-beautiful chanting of priests will be an abiding memory of Ethiopia. It is highly recommended that you hire a guide who can explain the unique features of each church and how the layout of major churches is a symbolic representation of Jerusalem. The entrance fee to the church complex is US$50 per person. 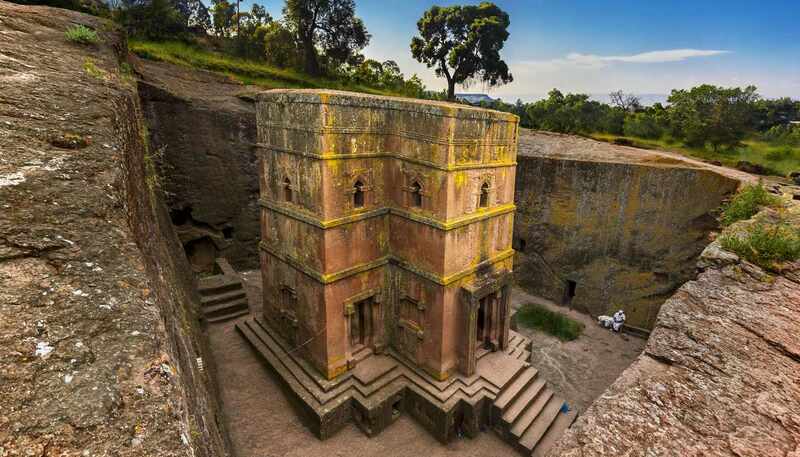 Apart from the churches, there is a good trekking network around Lalibela allowing visitors a cultural insight into village life as well as the chance to see other ancient churches including the cave church Yemrehanna Kristos. The Lower Omo Valley is home to 16 culturally distinct tribes including the Mursi, known for the lip plates worn by female tribe members, and Hamer, whose females are famed for their ornate hairstyles while the men must perform a dangerous bull-jumping ceremony as an initiation into adulthood. Market days - when people from all tribes flock to the region's towns - are a colourful and fascinating experience. Trekking along the escarpment, surrounded by jagged pinnacles, with the slash of the Great Rift Valley tumbling down before you is one of the finest panoramas on the continent. This is also the home of the Gelada 'bleeding heart' baboons. Coming face-to-face with a troop of them while ambling along is almost guaranteed. Visitors who can spend a few days trekking through its grasslands and deep ravines are likely to see Walia Ibex (mountain goats with arching horns) and Ethiopian wolf, both are endemic to the Simien Mountains. Experienced trekkers may also want to tackle Ras Dashen, the highest peak in the country. Entrance fee is 90 Birr per person with extra for a guide and a ranger. Carved into the towering canyons, the remote monolithic churches and monasteries of the Tigray region offer a fascinating look into religious life that has remained largely unchanged for centuries. The scenery here is ruggedly beautiful, and some of the monasteries are so precariously positioned they are reached by free climbing or a flimsy rope. Abuna Yemata Guh, one of the finest churches in the area, requires you to climb up the wind-worn sandstone cliff barefooted. Despite its remoteness, the church attracts about 80 worshippers every Sunday attending its service.